How many episodes of The Langoliers have you seen? An elderly janitor hurt in an explosion at a secret army lab run by "The Shop" starts to grow younger. A ruthless operative is sent to cover it up, so the janitor and his wife go on the run with the help of a sympathetic female agent. Nick Hopewell: [They're in the air after the world below has disappeared after the langoliers have eaten it. The sun is setting] It's going faster now, isn't it? Captain Brian Engle: Yeah. After awhile I think the days and nights will be going faster than a camera shutter can click. We're all going to Boston for different reasons. What about you, Nick? Fess up, the hour groweth late. Nick Hopewell: Well, why not? What does a Most Secret classification mean when you've just seen a bunch of killer hairballs rolling up the world? Q: Why did they "need" Mr. Toomey? 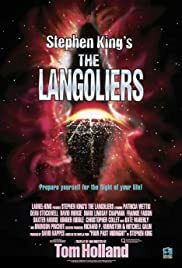 Q: Who or what are the Langoliers? Q: What are some of the differences between the film/miniseries and the novella? It's hard to rate this movie. The movie has moments of creative genius, others with banal stupidity. Some passengers on an overnight red eye flight awaken to discover most of their fellow passengers inexplicably missing, as if whisked away in some sort of biblical rapture. This is a delightfully creepy mystery, as is the abandoned airport where the plane lands, but the film bogs down in its irrationally slow reveal of the facts. The director compacts a 90-minute script into hours and hours of excessive subplots. Some of these are necessary for character development, (since the movie focuses on how these different personalities react to the situation), but the script burdens itself with a lot of clutter. Some of the actors overact, others underact. I blame the weak direction, as even David Morse seems awkward at times. Worst is the inconsistency of the menacing attackers. It takes them a zillion years to cut through some fields--you see objects collapse in the distance, but you see this same "approaching unseen monster" shot again and again. Then, when the things do emerge, they race around at a hundred miles an hour. The nature of how they go about annihilating their targets follows no logical pattern. The things are so bizarre looking they are both funny and scary, so you don't know whether you're supposed to laugh or not. The "corruptions of the time stream" are not consistent, either. It's as if the script made up rules how this would work, and then changed those rules whenever it felt like it. Even though some of the effects are confusing, others are downright cool. I love the portal; it was ethereal yet sinister at the same time. It evokes the intended curiosity: what lies beyond it? Overall, the movie is so weird that it holds your interest, but don't expect any sane continuity. If you look for sound thought in this one, you'll wind up as nuts as the movie is.